Who’s looking forward to Halloween crafting? We sure are! 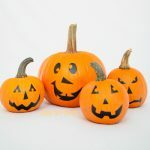 All the witches, ghosts, vampires but especially the pumpkins. 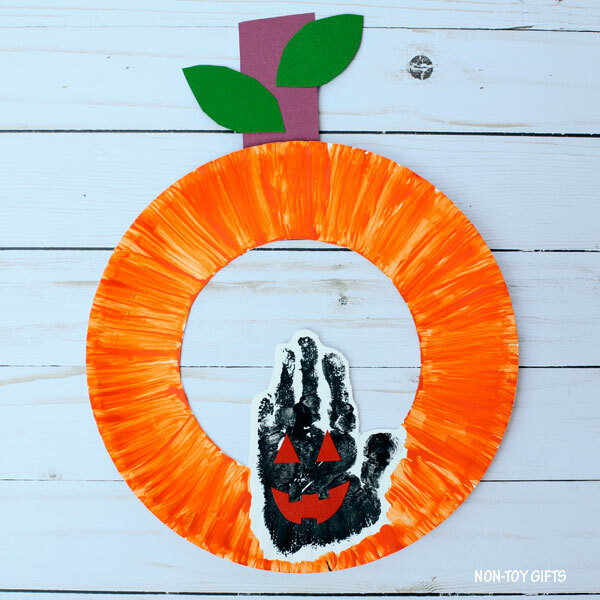 Today we’re adding a handprint pumpkin craft to our collection of 100+ easy crafts for kids. 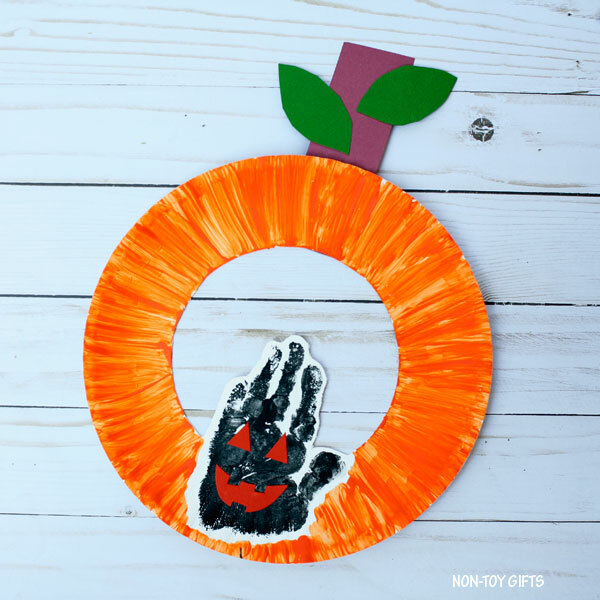 Handprint crafts are among our favorites. 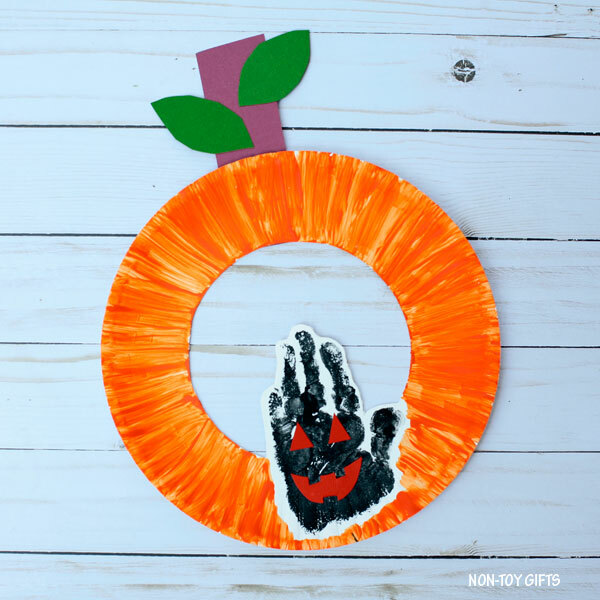 One little handprint adds a special touch to any craft. It makes it more personal and turns the craft into a darling keepsake. My boys used to be big fans of painting their hands or feet and create this way. Now, they would gladly skip the painting part so we moved on to tracing their hands or feet on colored paper. 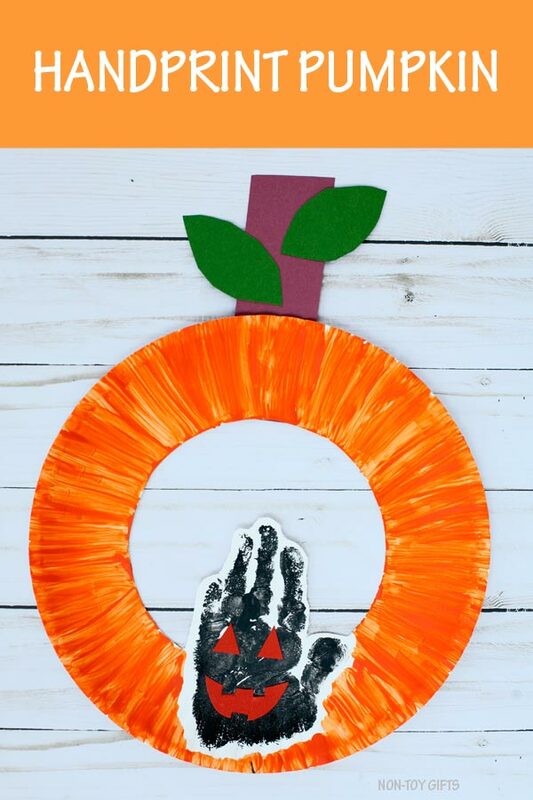 We created this handprint pumpkin craft last year when my youngest was still willing to get his hand covered in paint. 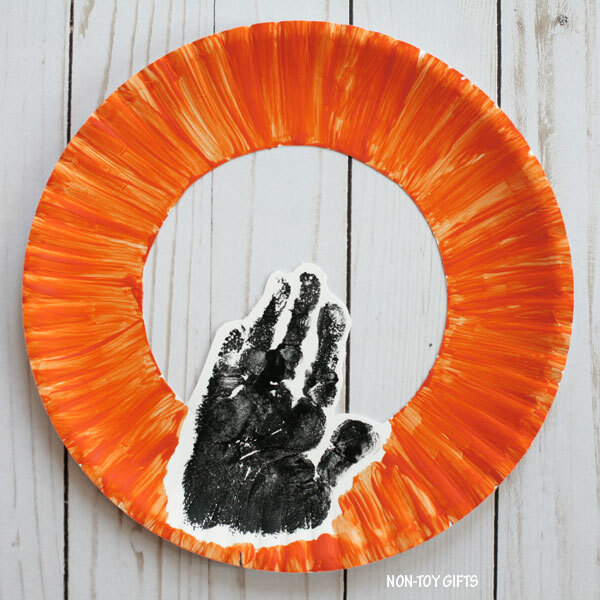 If I were to recreate the craft now, I would use black paper to trace my kindergartner’s hand and glue the handprint to the bottom of the paper plate. 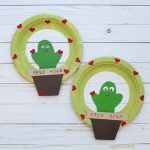 I love to use my kids’ crafts (especially if they come with handprints or footprints) for seasonal decoration. I keep them in a big box and when I take them out for the season, my heart melts. 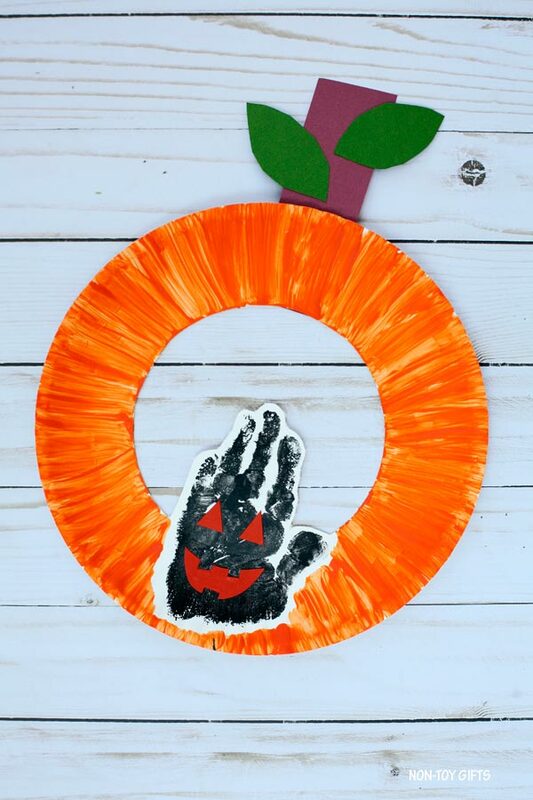 This handprint pumpkin can be easily used as a Halloween wreath. 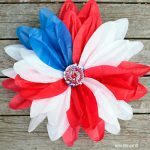 It is simple to make even with young kids. 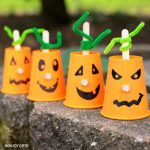 Need a Halloween craft to do with your baby? 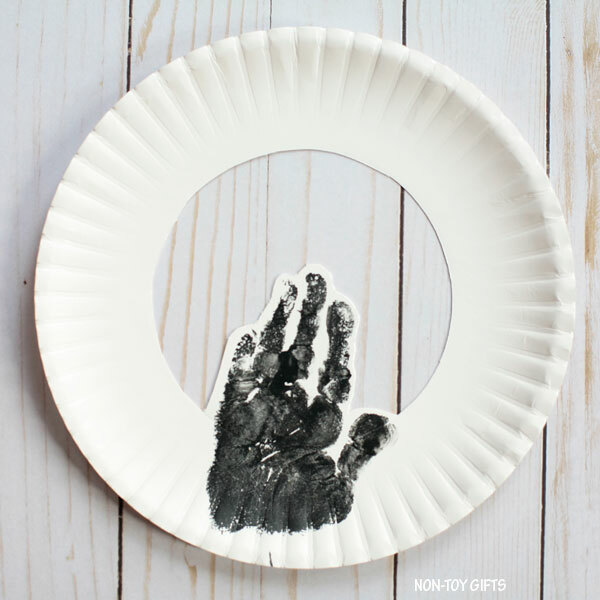 A fun handprint on a paper plate and the parents can do the rest. Start by painting your child’s hand with black paint. You may try and use a paintbrush but I found it’s easier with a sponge brush as it won’t tickle the kid’s hand so much. 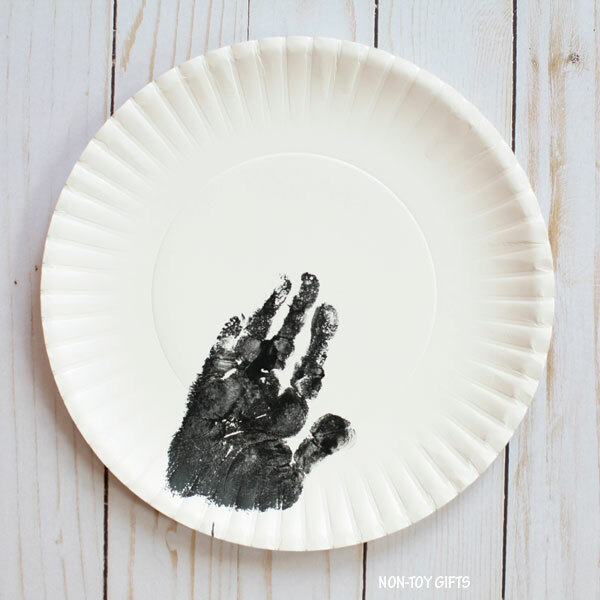 Once you have covered your child’d hand completely in black you can press it to the bottom of the paper plate. 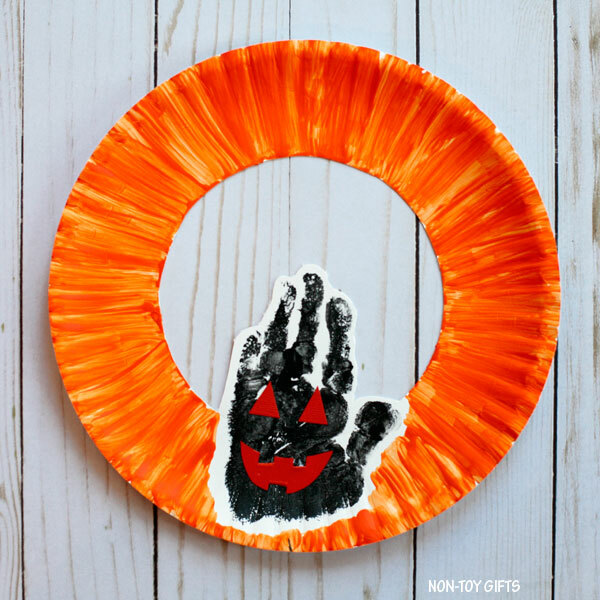 Cut out the center of the paper plate, being careful not to touch the handprint. I preferred to use a craft knife for this part but scissors will work, too. Don’t let a child use a craft knife as they are very sharp. Even if they are old enough to handle the scissors I would still suggest for an adult to do this step as it can be harder for a little one to cut around the handprint. 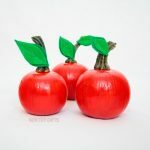 Let’s keep the craft fun and try to avoid any frustration and maybe tears. 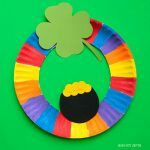 Paint the paper plate rim orange. 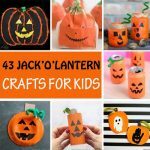 Add eyes and a mouth to your handprint Jack’O’Lantern. 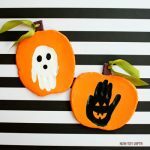 Draw them first on orange construction paper, cut them out and glue them on the handprint. Draw two leaves on green paper and a rectangle on brown paper and cut them out. I used card stock paper for the stem and leaves to make them look sturdier. But construction paper will work just fine. Glue the leaves on the stem and the stem to the back of the paper plate. We are done!